ASLA 2018 Professional General Design Honor Award. 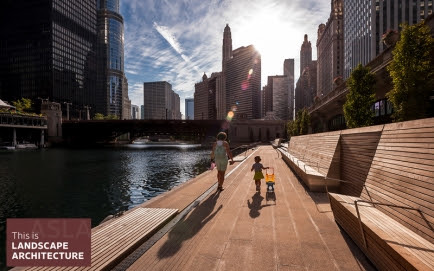 Chicago Riverwalk | State Street to Franklin Street. Sasaki and Ross Barney Architects. In the classroom – The expertise of landscape architects to integrate built and natural systems into a sustainable future is increasingly important. ASLA is committed to bringing students of all ages, from all backgrounds, into landscape architecture. In the halls of government – Landscape architects don’t only design for our future, they advocate for policies to make that possible at the local, state, and federal levels. All month long, ASLA will showcase the impact landscape architects have in the United States and around the world. To learn more, visit our website.